Akismet 2.2.1 — Now With Stats! If you upgraded to Akismet 2.2, you likely noticed a cool new feature: Akismet stats. We’ve now released Akismet 2.2.1, which includes a few bug fixes. 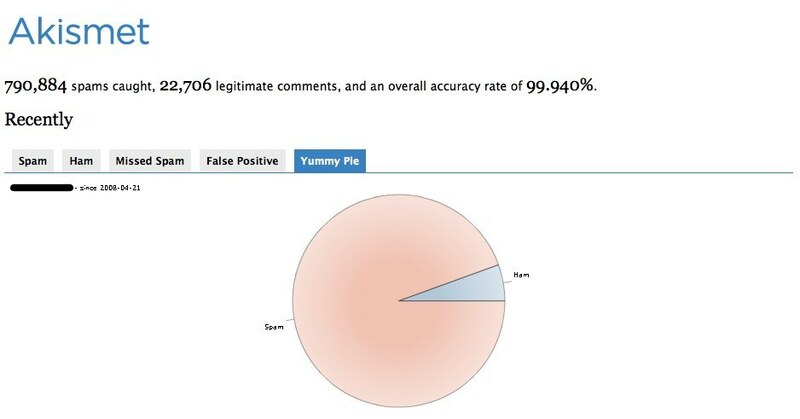 Akismet stats track your comment metrics, including missed spam, false positives (Akismet thought it was spam, but you disagreed), and Yummy Pie, which displays your ham vs. spam count in a nifty pie chart. What’s ham? The good stuff. Delicious, legitimate comments. Spam is the non-legitimate filler that Akismet excels at blocking. We’ve also made significant backend changes to speed up Akismet’s response time. If you think a comment is spam (or ham), the system will now adapt instantly to your feedback — a major improvement over the old adaptation time, which could take a few days. Can’t wait to play with the new release. Well done guys! Those are some pretty neat additions. I’ll be interested in viewing the spam/ham chart as well as missed spam to judge how well akismet is doing. Why not use straightforward English? Thanks for the statistics. It’s a useful addition. And the visuals are nicely implemented. @demetrius – unfortunately a great many people are taken in by what the spammers say. I wrote about this last year and this continues to this day. Akismet and any other anti-spam systems will always make mistakes which is why we have made significant improvements in this release of Akismet to mitigate against that, for Akismet to learn faster, for you to be more confident in your blog being protected. But people will also approve what is actually spam. I love the new stats feature with all of the pretty little charts! Yay Akismet! I noticed this new feature in my dashboard. Good going. It’s an interesting new feature. To tell you the truth I never thought that I need such a feature. But now, because of it, I realize that there is so much spam and so few real comments. The stats don’t show properly in FF3. The frame where the chart, etc should appear doesn’t appear full screen, but for a small bit. This is an interesting step to keep an eye on what’s going over author’s blog. I was quiet astonished when I saw the footer of this blog which mention that 86% of comments are spam! I’m enjoying the new features, though it’s leading me to ask a bigger rhetorical question – “Just how do we encourage more actual comments on our blogs?” The amount of spam vs. the amount of actual comments is quite disturbing to look at, but it shows you just how powerful Akismet is. Great job! Akismet flagged it but I let it through, only to catch it later while looking at the HTML source to troubleshoot something. Ah, but do you believe the figures. I have always had grave doubts about the spam count that it used to report. Now I know that they are all made up. 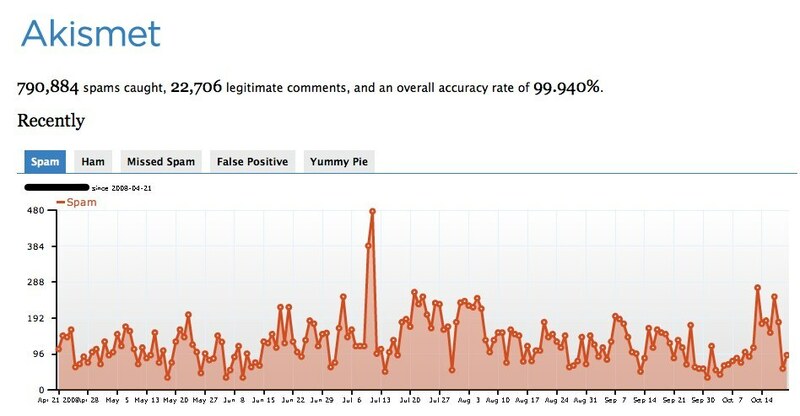 I have a relatively quiet blog – not many people visit and fewer comment – yet For October so far the stats report 1725 spam, 41 ham, 8 missed and 0 false positives. I know for certain (because I can count them) that I have only had 5 legitimate comments this month but there were 38 missed (I was wondering if Akismet had failed) and I always carefully reject each one using the spam button. I am pretty sure that the spam count is high as well – I clear them out each week and the count is usually about 2-300 a time, though last week was a bit higher. Is there an Akismet forum where I can ask a question? After 2 years of Akismet working fine, I’m getting overrun with 20-30 drug spams a day, all coming from a source using the same top-level URL (forged). Is there some way of blocking all comments that leave a certain top-level URL? Specifically, http://www.volny.cz……. Good plug-in! But there is a problem, namely: if the message has got in spam, that is two variants: or to exclude written of the list of spamers, or to confirm that it the spamer… It would be very convenient “to resolve button presence the message”. Could you please split php and css? I change css and with every update i need do it again. Are there release notes outlining the improvements to Akismet?